I thought some of my fellow nerds might want to check out some of the tabletop games I've made. Here's a link to my DriveThruRPG storefront. What does your process look like when you're developing a new game? How much do you reuse from book to book, and how much do you change every time? Oh, hey, responses! Thank you, montrith! Zekka: I try to change as much as possible from game to game, but if I hit on something that works, I may recycle it. The game I'm working on now has a similar task resolution system to my first game, but combined with a mechanism that started out life as the core mechanic for a game that I ultimately ended up scrapping. The two still don't mesh quite as well as I want, which is why it's still in playtesting, but the basic principle seems sound - play a card from hand, use its value to "purchase" the aspects of success you want. If you like Planescape, you might like the game I'm finishing up now. It's called Portal Rats, and it's an OSR love letter to my favorite 2e setting, using The Black Hack as a base with original subsystems grafted on to capture the planar flavor. It's available at my DriveThruRPG store now - check the link in the opening post. Two things: I'm finishing up a second edition of Wizards of the Three Moons soon, and I've set up an account on itch.io for my game output. 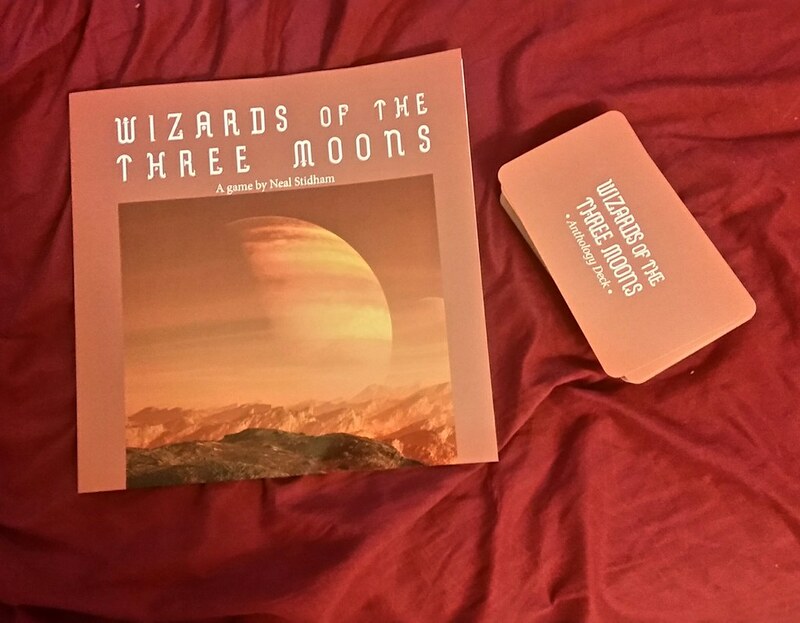 I created an Anthology Deck for Wizards of the Three Moons, and it's for sale at DriveThruRPG. It's a custom Tarot deck without art that you can write on, so as you have encounters you can record them directly onto the deck itself and make them part of the ongoing story. The card faces also have helpful game rule reminder text so you don't have to look things up as often in the rulebook while you play. I made a free storytelling game a while back. I don’t know if anyone has ever played it except me. Here’s ¡Viva San Judas!, the game of farcical misadventures in blame-laying in a banana republic. Cool! Are you planning to do any more, or was it just a one-off? The theme reminds me of Malandros, by Pelgrane Press: you should check that out if you get a chance. I may make another game if I feel like it, but I haven’t been inspired to do so. I also wrote a Fiasco playset a while back about small-town Utah. Wizards of the Three Moons 2e is now available digitally on DriveThruRPG. I'm doing print-on-demand this time, too, but the files have to go to the printer and then I have to approve proofs, so hard copies aren't available to buy yet. Wizards of the Three Moons is now available in print at DriveThruRPG, along with the accompanying Anthology Deck! Fiasco players: please beta-test my new playset, Chicago 1920.